Kamala Khan is a young muslim girl who idolizes the Avengers and wishes she could be more like Captain Marvel. A mysterious mist grants her wish, as she discovers that she has the power to shapeshift. Seemingly chosen for something greater, Kamala has to discover what happened to her, all while her traditional family is watching her like a hawk. 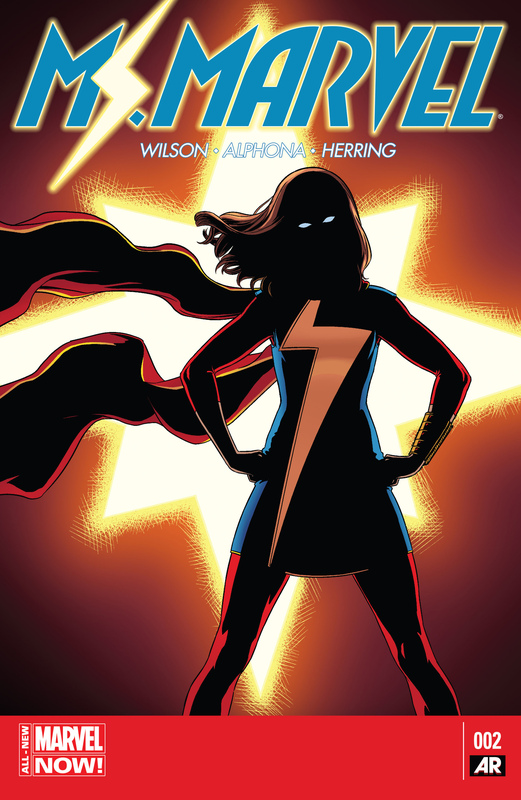 Ms. Marvel has been a fairly anticipated new series, and if the sales numbers for the first two issues are anything to go by it looks like only two issues in readers care enough to put this book in the top fifty for comics. And I think I can see why, it’s a really fun book. The characterization of our main character is excellent, her family dynamic is something we haven’t seen much in comics, and the book clearly has a good sense of humor to it. For how much marketers may go on about how audiences only want the familiar, which is why so many protagonists are white males, or sometimes white females. I believe that Ms. Marvel has proven them wrong. Speaking from a purely personal point of view, the only reason I bought this book–as someone who hasent read Marvel in years–and have added it to my pull list, is because the main character is muslim. It was marketed as a breath of fresh air, which goes to show that at least somebody in Marvel know what they’re doing, and a breath of fresh air is exactly what it is. Not only is Kamala relatable in the typical “young person wishing for more” kind of way, but her background makes that tired old trope just a bit fresher. We can all relate to overbearing parents, but the added element of a culture and religion that many readers will be unfamiliar with makes even the mundane tropes employed in the writing all the more interesting. If it were a white girl feeling like her parents are overbearing I’d yawn and pass the book over because I’ve seen that a million times. But when it’s a muslim girl who is rebelling against her overbearing parents then that catches my attention. Because it’s something I’ve not experienced myself, and hence it becomes all the more interesting for my lack of familiarity. Besides the introduction of Kamala’s social circle, her family life, and gaining her powers not much happens. With the introduction out of the way the story could go anywhere. And based on what I’ve seen so far I think a slow burn with Kamala slowly discovering her powers while she learns how to become a hero, followed by a large threat she has to face is the most likely path this story will take. The cast of characters, besides Kamala herself, are quite excellent. We have the typical friend, a potential love interest, her family, and even the bullies. But what I like about the “bullies” in this case is that they aren’t the typical bullies. Rather than being mean for no reason, Zoe manages to be a bully, while at the same time being less obvious about it. In fact, at first Kamala didn’t think she was actually being mean, as Zoe was more a master of the passive aggressive approach to putting others down. I wonder what direction her character will take, after Kamala in her Miss Marvel costume saves her. Perhaps she will be the Flash Thompson for this book. The actual gaining of the powers scene was very interesting. The mist and strange black substance surrounding Kamala are not explained, which gives the story a sense of intrigue that “was bit by radioactive spider” does not quite have. Normally the gaining of the powers is ignored as just a plot device, while here it is in itself a mystery and I look forward to discovering what exactly happened. I highly recommend this book to any comic fans. Even those that don’t read Marvel. It’s easily the most accessible piece I’ve read in a long time, where reboots aren’t quite able to escape the backstory, a brand new story, with a brand new character is just the stepping stone a new reader needs. Pre-Order the Trade Paperback Here!